Dog training is something that every dog owner thinks about at one time or another. Some may casually wonder occasionally if they need to look into it, while others make like a jet for the first place they can find to save their belongings from their new puppy. While dog training is a great way to get your dog to behave, it should not be taken lightly. Finding the right trainer is imperative. What should a dog owner look for in a dog trainer? While it may seem to go without saying, the dog trainer should love your dog. This is your pride and joy. You are leaving your baby with someone other than you for a sizeable amount of time, and unfortunately, some dog trainers do not always have the dog's best interest at heart. The best way to gauge how a dog trainer feels about your dog is to observe them together. You will see in how your dog responds and how he acts around you after spending time with the trainer whether or not things are okay. Dog training respects the owner as well as the trainer. If this is not the case, then move along. One of the best signs of respect a dog training service can show an owner is a free meeting between the dog, owner, and trainer. Another great sign is if there is a dog and owner orientation session prior to training. This allows everyone to get on the same page, and lets you as the owner know what to expect. Word of great dog training gets around. Look for recommendations from those you know and trust. Observe their dogs and get a feel for what their training involved. Find out who they used and if they have any complaints or would do anything differently given the chance. Word of mouth is a great way to find out about any service, but in the case of dog training, it is especially important. 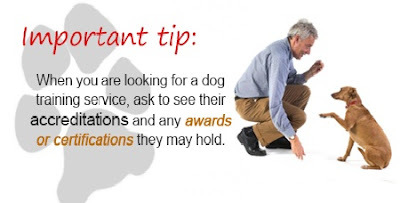 When you are looking for a dog training service, ask to see their accreditations and any awards or certifications they may hold. Take note and verify that they are legitimate on your own via online research or phone calls. To learn more about dog training services, click here. Your dog is your family, and as such you owe it to him or her to take time and care when looking into dog training. These steps will help, but the best advice is to follow your gut instinct. You know your dog, and your dog trusts you. You will know if something is wrong. Faith Stewart writes for a variety of web sites, including sites like Metrodog.com.